Atherosclerosis of the aortic arch branches is usually a multifocal disease with lesions of some degree at the origins of all three branches and in the wall of superior aspect of the aortic arch as well (Fig. 4.1). 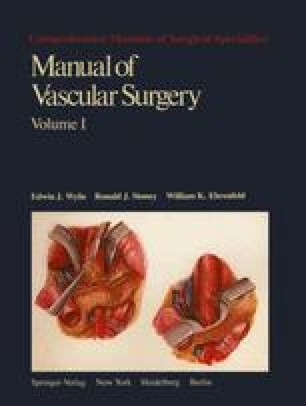 Three general observations are pertinent in defining surgical indications and in the selection of the appropriate operative approach: (1) the extent of individual artery involvement is rarely uniform; (2) except for embolization from the rare ulcerating lesions or progression to occlusion in the case of the left common carotid artery, most of the atherosclerotic lesions at this level do not produce stroke; (3) the collateral channels across the thorax, neck, and face are so voluminous that the net result of single or multiple lesions is often one of symptoms from reduction of total cerebral perfusion rather than of symptoms confined to one area of the brain.